1. Start by making the hollandaise. Lightly whisk two egg yolks into a bowl. Melt 4 Tbsp. of butter and slowly add to the egg yolks while whisking vigorously. Squeeze half a lemon into the bowl, whisk together and add salt and pepper to taste. Let the hollandaise rest, it should thicken up a little. 2. Cook the bacon to your desired crispness on a pan, and toast your English muffins. 3. While the bacon is cooking, boil water and poach the four eggs. 4. Heat a pan on medium and melt the remaining 4 Tbsp. of butter. Once melted, add the lobster tails for about a minute on each side, just to warm up. 5. 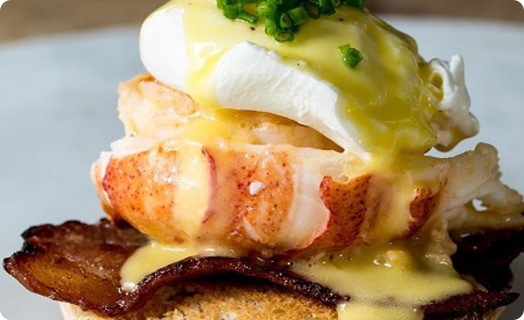 To plate, place the bacon on top of the toasted English muffin, add the lobster tail and then the poached egg. Drizzle on the hollandaise and top with chives.